“I want her to resign by Sept. 21, 2016, the 20th anniversary of my brother Lamar’s death”—Arnetta Grable, Jr.
Wayne County Prosecutor Kym Worthy points to autopsy diagram of body of Terrance Kellom, 19, during press conference Aug. 19, declaring no charges will be brought In his death. DETROIT – ““I knew she wasn’t going to prosecute this dude,” Arnetta Grable Jr. told VOD after Wayne County Prosecutor Kym Worthy’s announcement on Aug. 19 that no charges would be brought against I.C.E. 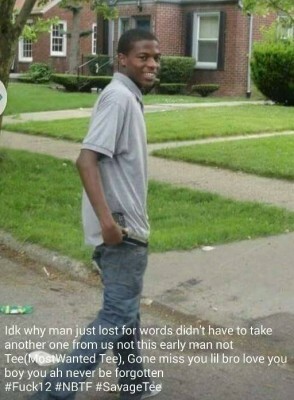 agent Mitchell Quinn in the death of Terrance Kellom, 19, on April 27. “I knew the media was going to prosecute Terrance Kellom at the same time, like they did with my brother Lamar,” she said. Grable has been active in the protest movement against Kellom’s killing by a “Detroit Fugitive Apprehension Team. 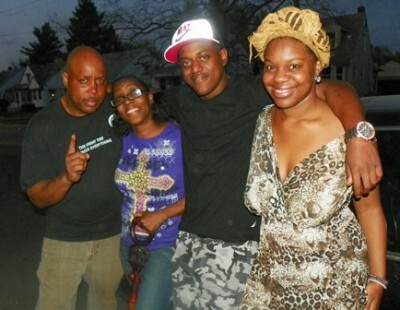 Arnetta Grable, Jr. (r) with others at vigil for Terrance Kellom May 2, 2015. Three-time killer cop Eugene Brown shot Grable’s brother Lamar, 20, to death in 1996. Worthy also refused to prosecute Brown, despite a multi-million jury judgment in the family’s favor, and exposure of an internal police report recommending that charges be filed against Brown for killing Grable and others. The family’s battle to clear Lamar’s name took ten years, overlapping Worthy’s tenure in office. Kellom was shot multiple times and killed after a seven-member multi-jurisdictional Detroit Fugitive Apprehension Task Force (D-FAT) invaded his father Kevin Kellom’s home with an armed robbery arrest warrant, but no search warrant. Police identified the shooter as Immigration and Customs Enforcement (I.C.E.) agent Mitchell Quinn, a former Detroit police officer. They said he fired because Kellom threatened him with a hammer. 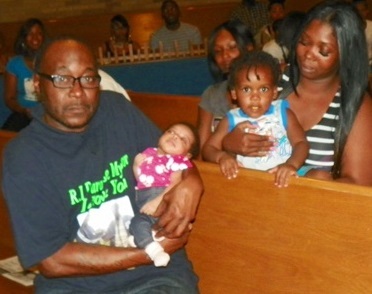 Kevin Kellom holds his newborn granddaughter Terranae Destiny Kellom at rally June 18; his grandson Terrance Desmond Kellom is behind him. Part of timeline slide Worthy showed at press conference. 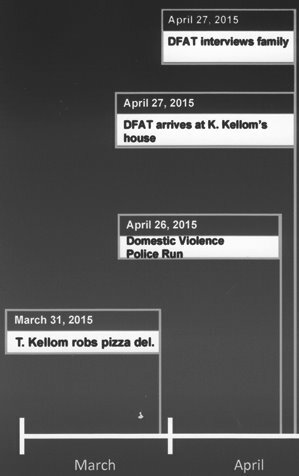 That was the arrest warrant police were executing when they also executed Kellom. 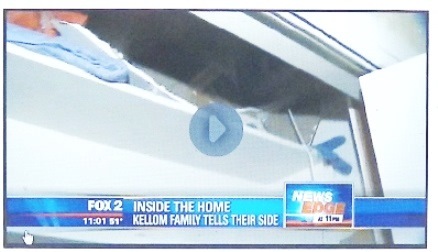 They entered the home without a search warrant, which was not signed until hours after Kellom was killed. Worthy also claimed Kevin Kellom, who said he had witnessed the first two shots before police shoved him into the dining room, lied repeatedly in his accounts. She said Kellom and five other witnesses, out of a total of 17, were subjected to interrogations through court-ordered investigative subpoenas. At these events, individuals are not allowed legal representation and are forced to give their statements under oath in a hostile atmosphere. Numerous police cars surrounded the Kellom home at Evergreen and W. Chicago on Detroit’s west side during the press conference, according to a report from a Kellom family member. Evidently, Detroit Police Chief James Craig feared a popular uprising in reaction to the decision. Hundreds had marched outside the Kellom home, taking the streets, the day after Terrance Kellom was killed, as a fiery rebellion raged on in Baltimore against the police custody death of Freddie Gray, Jr. A vigil and three other protests of Kellom’s death occurred afterwards, with one still planned for August 28. Quinn, a U.S. Marshal, two sheriffs from Oakland and Wayne Counties, one Livonia police officer, and two Detroit police officers comprised the D-FAT team involved, Worthy said. 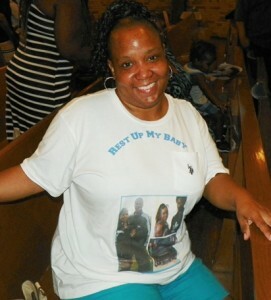 Terrance Kellom smiles for a friend who grieved his death on Facebook. “Terrance Kellom was shot four times,” Worthy said, as she laughed during an aside with a Michigan State Trooper, because she at first said seven times. Family attorney Karri Mitchell has contended all along that Kellom was shot at least once in the back, shedding doubt on the police contention that only ThQuinn shot Kellom as he ran towards him holding a hammer. 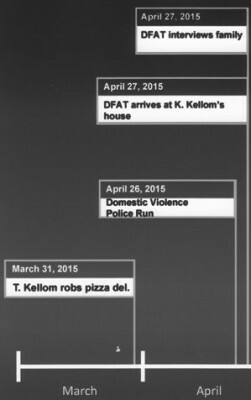 The downward trajectories of the wounds also do not appear to support the prosecution’s claim that Kellom was standing up as he advanced on D-FAT members. Kellom’s father said at one point that he fell to his knees after the first two shots. 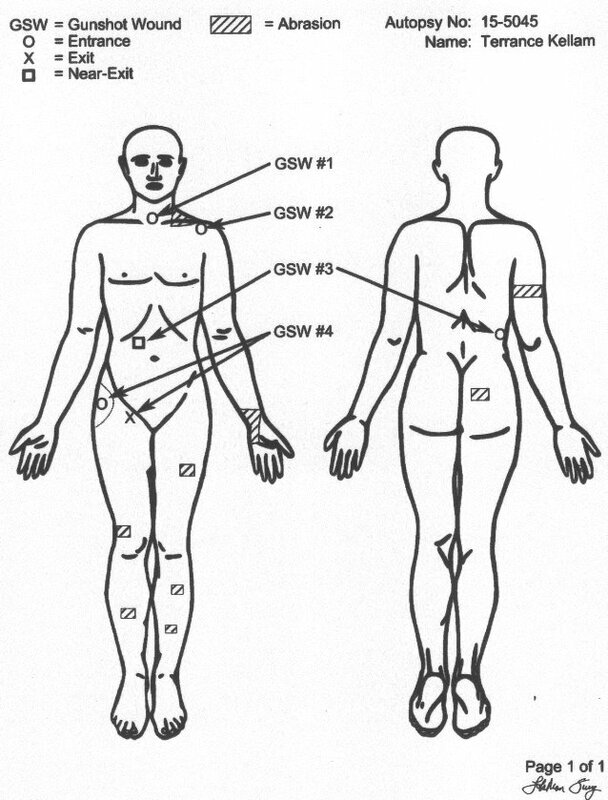 Terrance Kellom autopsy diagram shows he was shot in the back as family and attorney claimed. Worthy showed a body diagram of Kellom’s gunshot wounds from the Wayne County Medical Examiner’s (WCME) autopsy report, but did not release the entire report to the media at the time, or to his family afterwards, choosing instead to give her own interpretation of the chart. The report was finally released the next day. In a highly unusual move, Worthy earlier ordered the autopsy report and all other evidence in the case sealed pending her decision on charging Quinn. She said she could not cite a legal explanation for this and referred that question to attorneys for the ME. In its original May 8 Freedom of Information Act request for the report, VOD cited Swickard v. Wayne County Medical Examiner, 438 Mich. 536, 475 N.W.2d 304, 19 Media L. Rep. 1833 (1991), affirming 184 Mich. App. 662, 459 N.W.2d 92, 17 Media L. Rep. (1990) (summary disposition affirmed for newspaper in FOIA action holding autopsy reports to be public records). Kevin Kellom’s wife Yvette Johnson at protest June 8, 2015. “Kevin Kellom’s girlfriend was in the upstairs bedroom partially clothed, so a female officer was called upstairs,” Worthy said. Worthy said no fingerprints were identified on hammer, which she alleged Kellom used to smash a hole in a crawl space floor, then threaten police. 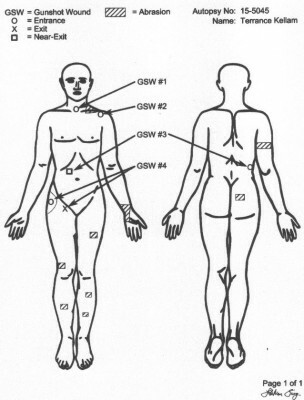 Circled areas show drops of blood id’d as Kellom’s. Despite Worthy’s description of Kellom’s repeated, forceful use of the hammer, she said Kellom’s fingerprints were NOT found on the hammer, only spots of his blood. 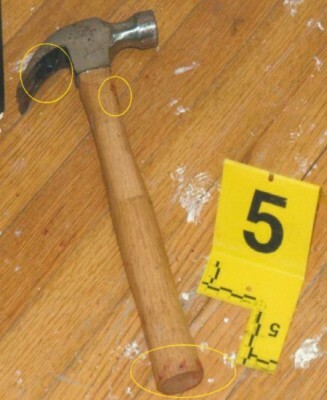 She showed a photo of the hammer and a map describing its alleged location on the hallway floor near where Kellom fell. This reporter earlier went to the upstairs bedroom involved with a family member. The “crawl space” is actually part of that bedroom, not an “attic.” There is no third level in the house. A very small hole in the crawl space floor was observed, which did not appear large enough for a human being to get through. Worthy claimed it was large enough for Kellom, who was 5’9” and 145 lbs., measuring it at 20 by 11.5 inches. There was additionally no heating duct apparatus in the crawl space, although photos Worthy displayed of it showed large pieces of metal hanging out. The photos were hard to interpret and are not shown here, but in the link at bottom of story. They contain several confusing overlays. She did not explain why the three police officers said to be in the room stood by idly while Kellom took time hammering a hole in a solid floor, instead of restraining and cuffing him. “Quinn heard him dropping to the floor [in the southwest bedroom],” Worthy continued. Worthy said a joint Detroit and Michigan State police task force investigated Kellom’s death, and her office followed up with its own investigation during the 98 days following the issuance of a warrant for Quinn. Quinn is a former Detroit police officer who compiled his own record of brutality lawsuits and a felony charge of assaulting his former wife, which was later dismissed, during his time on that force. Map showing where fired bullets were found. 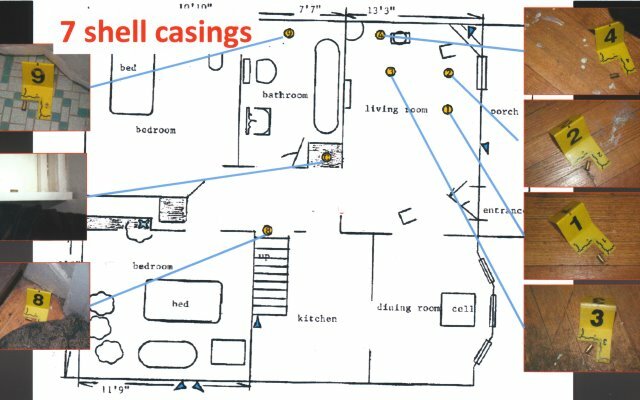 Map showing location of shell casings from fired bullets. 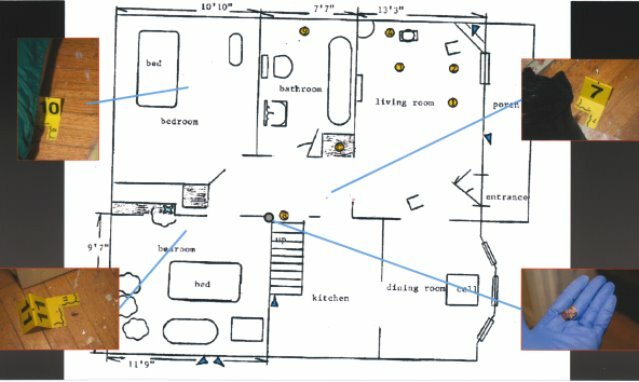 Worthy said the investigation also considered “dozens” of pieces of evidence, including bullet trajectory, blood spatter patterns, paint analysis, fingerprints, trace evidence of insulation fibers and drywall, serology including DNA, and blood analysis, in addition to witness interviews and the autopsy report. 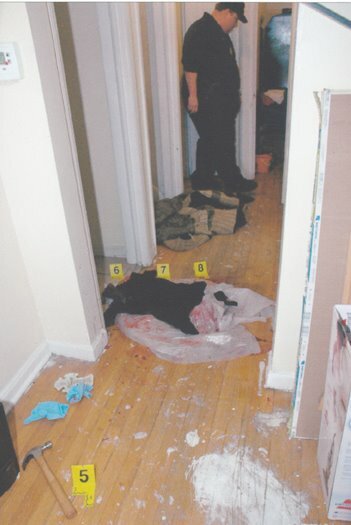 Photo of hall after Kellom’s killing. It is not time stamped. It is unknown whether hammer at lower left was there when Kellom was killed, or was placed there by police afterwards, like a “throw-away” gun. She displayed a map of shell casings and bullets found. She said there were seven fired jacketed .40 caliber bullets, one in the southwest bedroom, one in the northwest bedroom, one in the hall way at the base of the steps, and one lodged in the doorjamb of the stairwell behind its molding. Seven spent .40 caliber casings were also found, four in the north half of the living room, one in the hallway at the base of the stairs, one along the north wall of the bathroom, and one in the top shelf of the closet at the end of the hallway. The three other bullets were found in Kellom’s body by the Medical Examiner, she said. She did not identify from whose gun(s) the bullets came. Worthy said fibers and drywall particles shown in the photos had adhered to Kellom’s clothes as he allegedly jumped through the hole, but that the MSP lab could not match paint chips found on Kellom’s clothing to the paint in the ceiling of the southwest downstairs bedroom. Cornell Squires, of the Original Detroit Coalition Against Police Brutality, was present during the April 28 rally at the Kellom home. 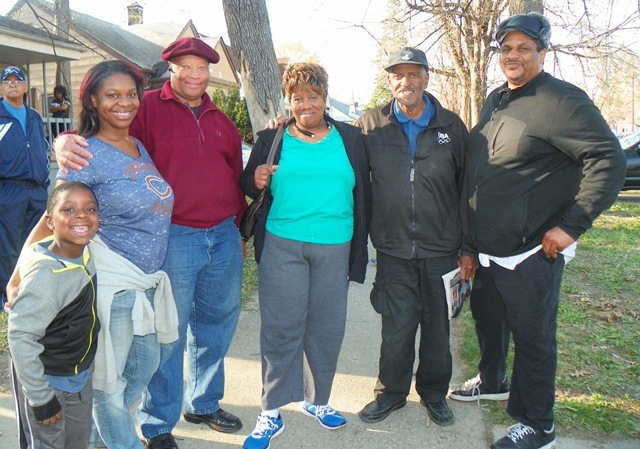 Members of the Original Detroit Coalition against Police Brutality at the April 28 protest against Terrance Kellom’s killing. They are (l to r), Arnetta Grable, Jr., Butch Carrington, Arnetta Grable, Sr., Herman Vallery (father of Lamar Grable), and Cornell Squires. Rev. Curtis Williams of Trinity Chapel Funeral Home refused to allow second autopsy of Terrance Kellom unless family paid additional fees for funeral. Arnetta Grable, Sr. said she had already lined up Macomb County Medical Examiner Mark Spitz to do a second autopsy at the funeral home, with repairs to the body completed in time for the funeral. But Roosevelt “Butch” Carrington, Jr. whose own brother Rodrick Carrington was killed by Eugene Brown in 1995, said he went to the funeral home with his cousin Kevin Kellom. 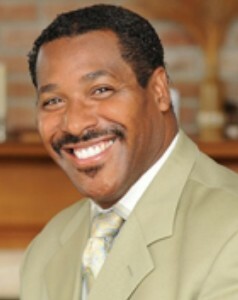 He said funeral home director Rev. Curtis Williams told them the funeral would cost more money if a second autopsy was done. Worthy said during the press conference that she has prosecuted numerous cops, including one recently for lying during an investigation. However, during her tenure, she has prosecuted only two police officers out of dozens who killed Detroiters, in cases covered by this reporter. They were Detroit cop Joseph Weekley, who killed Aiyana Jones, 7, in 2010, and Michigan State Trooper Jay Morningstar, for killing a homeless man in Greektown. The prosecution clearly threw the case against Weekley during three trials covered extensively by VOD, and a jury acquitted Morningstar. Arnetta Grable, Jr. said new leadership is needed, reflecting the sentiments of many young people across the U.S. as they watch their counterparts slaughtered by law enforcement, up to 746 so far this year alone, according to statistics compiled by http://killedbypolice.net. Members of Lamar Grable’s family and other victims of police officer Eugene Brown outside Frank Murphy Hall, where they met with Kym Worthy’s staff to demand charges against Brown. She refused to charge him. 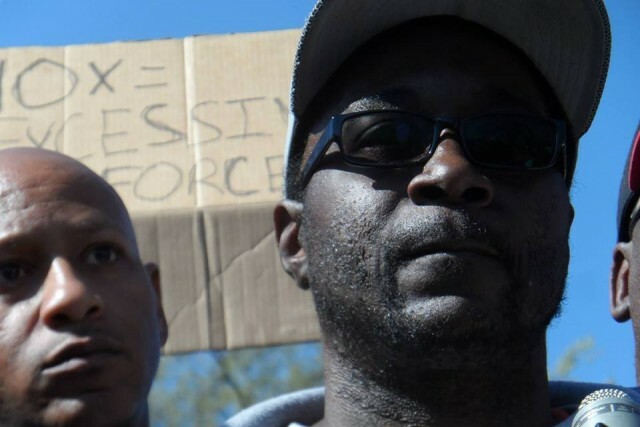 So-called community leaders in Detroit have repeatedly stopped or sabotaged militant protests like that in Baltimore which forced murder charges to be brought against four cops involved in the police custody death of Freddie Gray, Jr. 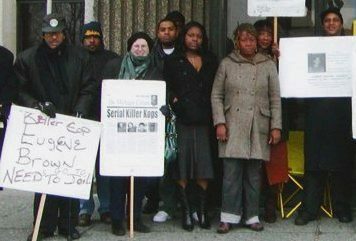 Hundreds who attended a vigil for Aiyana Jones the night of May 16, 2010, after Detroit police killed her that morning, began to march on the police station afterwards, but were stopped by Ron Scott, according to three individuals present at the vigil, including Kenny Snodgrass, who took the video below. A march and rebellion at that time may have changed the tenor of events afterwards, during which the entire Jones family has faced unrelenting media attacks and watched as killer cop Weekley walked. Two weeks later, Rev. Horace Sheffield, Sam Riddle, and several others forestalled a mini-rebellion in an east-side neighborhood near Aiyana’s after Grosse Pointe and State Police shot and wounded an unarmed young man in the neck as he exited his car after a chase. 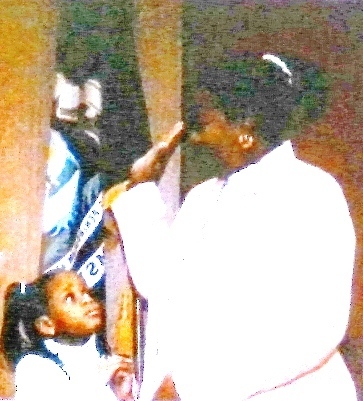 Kym Worthy takes the oath of office as Prosecutor Jan. 6, 2004, as her adopted daughter Anastasia looks on. Worthy has refused to support state legislation barring juvenile life without parole. Grable, Jr. called Prosecutor Worthy an “evil” person. WE’VE HEARD FROM KYM WORTHY; NOW KYM WORTHY HEARS FROM US! Over? This ain’t over by a damned sight! 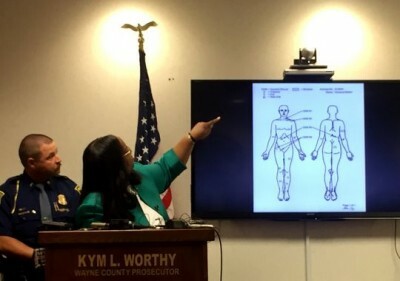 Wayne County Prosecutor Kym Worthy did a great job acting as defense attorney for ICE agent, Mitchell Quinn by dehumanizing the victim, Terrance Kellom and slandering his family. Unfortunately, that’s not her job. As prosecutor, Kym Worthy’s job is to protect us from killers. Sometimes those killers happen to be cops. Marchers protesting Terrance Kellom’s death on April 28 also remembered Aiyana Stanley Jones. You can’t convict killers by taking everything they say at face value and looking for evidence to support their claims. Worthy has held all the cards for 4 months. Now we’ll have some time to look at her hand and point out discrepancies in the police account the way she was able to find fault with the account of a traumatized man who’d just seen his son die before his eyes. If only this were an isolated case. Sadly, it is not. As with the cases of RIP Aiyana Mo’Nay Stanley-Jones. and RIP Adaisha Miller, Worthy did everything in her power to shield the police from accountability for the death of Terrance. Stand with us Friday as we assemble in the plaza outside the Frank Murphy Hall of Justice at 4pm. We’ll begin to delve into the evidence against Mitchell Quinn with a critical eye and let Kym Worthy know what we think of her performance. 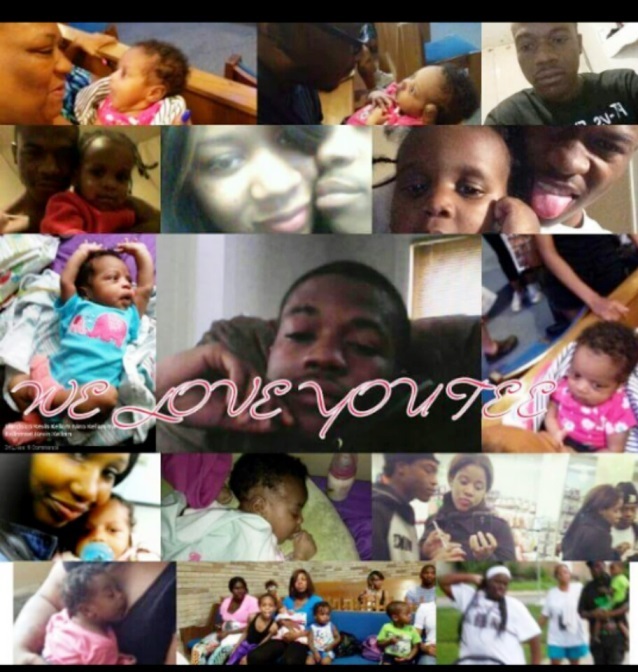 This entry was posted in Uncategorized and tagged AiyanaJones, Beatbackthebullies, blacklivesmatter, blacklivesmatterDetroit, BLMDetroit, Fuck12, LamarGrable, NBTF, ODCAPB, PoliceState, PrisonNation, SavageTee, TerranceKellom. Bookmark the permalink.